← How young is too young to learn canine massage? Every now and again I get the odd one to add to my list. For example, I was once referred a dog who really struggled to poo. When she came to see me, she hadn’t been for a couple of days. Would massage help? Dunno, but stand clear and let’s try. For the next few days I received multiple texts from the owner detailing quantity and quality of that dog’s movements. It worked. There’s a new benefit then…helps to poo. And yesterday I added a new benefit. 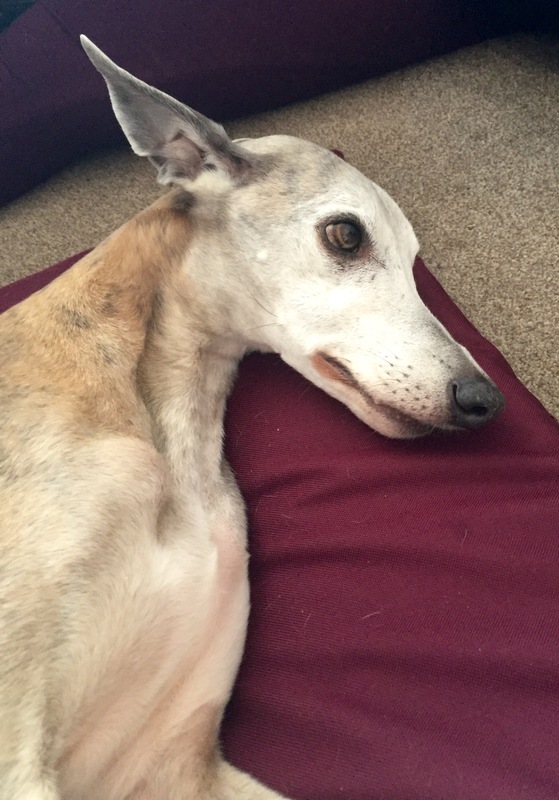 Lovely anxious Whippet Sonny has been suffering from neck issues for some weeks now causing yelps and general depression. He came to see me last month and has now visited a chiropractor who put his pelvis back in alignment while making tweaks to his neck. Yesterday’s massage was much easier with Sonny adopting his usual “I’ll just lie here Dr Les” pose. 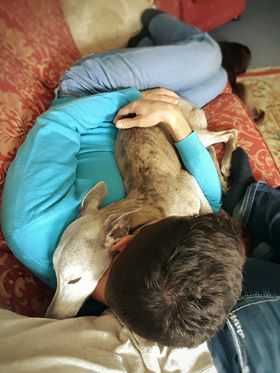 When I got home I received a message and photo from his Mum saying “First cuddle we’ve been allowed to have in longer than I can remember! Very rare, he must be feeling better. Thanks again”. So there we have it….massage benefit number 7654321 : Increases and Restores Cuddling Ability. That’s going to be one of my favourites. This entry was posted in acheypaw, achy paws, AchyPaw, achypaw myotherapy, agility, arthritis management, Brighton Dog Massage, canine arthritis, canine arthritis management, canine myotherapy, canine myotherapy, dog myotherapy, achypaw myotherapy, myotherapy, achy paws, conditioning, Dog, Dog massage, dog myotherapy, injury prevention, massage benefits, multimodal, multimodal therapy for dogs, myotherapy, prevention, south coast dog massage, Sussex, Testimonial, Therapeutic, therapeutic massage, well dogs and tagged achypaw, achypaw myotherapy, achypaws, canine arthritis, canine arthritis management, Canine massage, Dog massage, dog muscle therapy, injury prevention, massage, massage benefits, prevention, south coast dog massage, therapeutic, therapeutic massage. Bookmark the permalink.